The Judo was the first Japanese martial art to introduce the system of colored belts as a way to indicate the progression of student. Shodan ou Shoudan: Havia significava is acquired or novice status. Chudan ou Chuudan: average level of practice. This meant that the individual was seriously committed to their learning, school and teacher. Jodan ou Joudan: the highest rank. 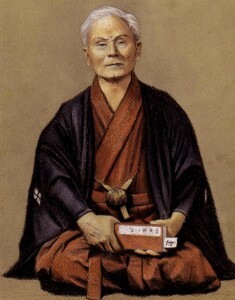 It meant no input or Okuden (school, system and secret tradition of martial arts). If the individual remained ten years or more from your master, demonstrating interest and dedication, received the Menkyo, to licença that allowed ensino. This license could have different names such as: Sensei, Shihan, Hanshi, Renshi, Kyoshi, depending on each particular system. The license itself which could bestow and bequeath the above Menkio, the certificate was Kaiden, also qualified to teach, implied that the person had completed its full learning. Kano was an educator and knew the people, knowing that there are many who need a boost immediately after he started practicing martial arts. Anxiety of this type of practitioner can not be filled by long-term objectives. 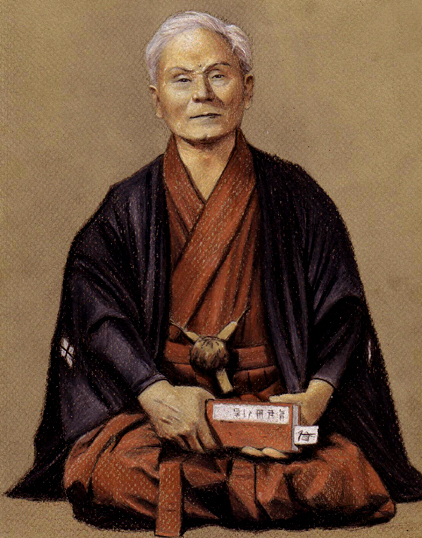 Shortly after, and fruit of friendship and exchange of knowledge between the SenseiJigoro Kano e o Sensei Gichin Funakoshio, the same system was adopted by the Karate, was first used in their schools Karate Shotokan. The grading in Karate is important to indicate the level of experience of practitioners, and is seen as a sign of respect for junior athletes. To demonstrate the degree karateka wear a belt at the waist with a color. The order of colors of ranks vary from style to style but, as standard, the beginner track is white. 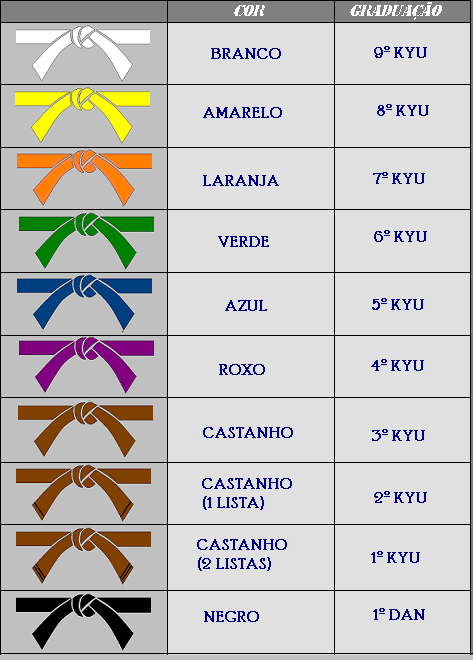 In the classification of colored belts, Kyu means class. The order of this classification is decreasing, 1 kyu being the highest class. In the classification of black belts, And means degree. The first is a black belt 1st Dan, the second is a 2nd Dan, and so on,in ascending order. A symbolic nivel, white represents the purity of the novice, and black refers to the knowledge established during years of training. 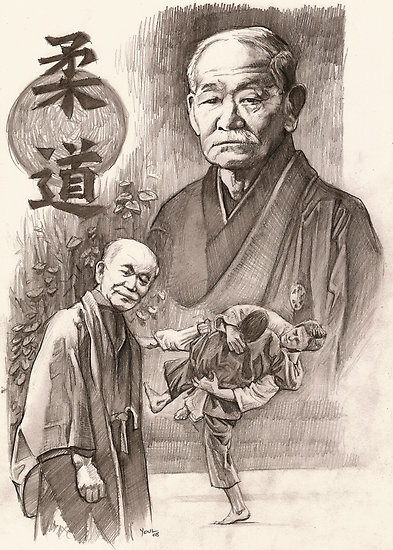 Since it was established and accepted system of colored belts, graduation of Karate is much like the school system, a paradigm in which students achieve degrees more advanced and more complex until you get the master. No Exame, tests are performed with different characteristics and requirements, according to the degree of knowledge required for graduation immediately preceding, ou historian, students get to graduate next, if you can demonstrate that all knowledge learned for the grade that occupies and intends to overcome; In short only when the student has learned all of a stage that is ready to proceed in the way of Karate. Usually, also requires a certain period of time between examinations and other. There is no consensus on the programs of testing range, ranging from organization to organization, or even dojo to dojo.